168 in stock Need More ? Double bill of Disney animations following the adventures of young Native American woman Pocahontas (voice of Irene Bedard). 'Pocahontas' (1995) follows the eponymous character and her tribe, whose lives are dramatically changed by the arrival of a shipload of English settlers. Amongst them is handsome adventurer Captain John Smith (Mel Gibson) who falls for Pocahontas. However, her powerful father, Chief Powhatan (Russell Means), disapproves of the relationship, and when it becomes apparent Smith's fellow settlers are planning on robbing the Native Americans of their gold, Pocahontas is forced to use her position to try and save the day. 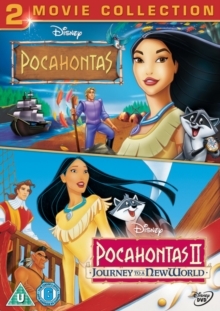 In the sequel, 'Pocahontas II - Journey to a New World' (1998), Pocahontas is on a peace mission to England, accompanied by dashing sea captain John Rolfe (Billy Zane). Upon arrival in London, Pocahontas prepares for the King's Ball, but the reappearance of both former beau John Smith (Donal Gibson) and disgraced Governor Ratcliffe (David Ogden Stiers) throws her into a quandary.